This sweet and salty homemade bourbon peanut brittle recipe is easy to make and it goes from measuring cup to mouth in about 20 minutes! A few simple ingredients, a heavy pan, and a candy thermometer and you’ll be eating this foolproof candy in no time. I may have mentioned one or a thousand times that I have a growing collection of vintage cookbooks and recipes. I pick them up whenever I see one that strikes my fancy, read that whenever I see one. Now, to me vintage means prior to 1970. I will accept that the dishes I ate in the 1960s could maybe be called vintage but the 70’s were just a few years ago. My cookbooks range from the 1920s to the 1960s but I have family recipes that date much further back than that… A lot of the recipes that show up on this blog are those recipes that I have adapted and updated. This is from a 1940s cookbook… except the bourbon part. That’s something I did all by myself. OK. I am going to stop right here and tell you that my computer hiccuped and I’ve lost almost this entire post. I was just about finished and I lost an hour’s worth of work. I am sure that y’all would have loved the wonderful story I shared but apparently the universe wanted to keep it short and sweet. SO…. Let me just say that I usually won’t make candy on a humid day — it just doesn’t work out. Well, we have had a month of rain here in Dallas-Fort Worth and cloudy, humid days when it isn’t raining. Don’t get me wrong — I love the rain! My tomato plants are GINORMOUS! But it is not good for candy making. Still, I had been putting off making a batch of this homemade bourbon peanut brittle (is there any other kind?) for a month and decided to just make it and hope for the best. This recipe worked beautifully in this humid weather so I think you should be just fine no matter what the weather is at your place. I’m looking at you, Seattle. This easy peanut brittle has just a hint of bourbon. You can make it in under a half hour -- great for gifts or to fill your own candy dish! Cover a large cookie sheet with parchment paper. Do NOT used waxed paper. Bring the sugar, corn syrup, water, and salt to a boil in a heavy saucepan, stirring constantly. Once the mixture boils stop stirring and let the temperature reach 295F to 300F. Add the bourbon, vanilla, butter, and peanuts and remove from heat. Stir it until the butter melts and is mixed in. Quickly pour out on the parchment, spreading it as thin as possible with a spatula. Sprinkle with the vanilla sea salt if desired -- a little goes a long way! Let cool just until you can stand to touch it and pull the candy as thin as possible. Drizzle with melted chocolate if desired and break into pieces. Part of the Meal Plan Monday Christmas Candy Round up! Oh my! Peanut brittle spiked with bourbon! Heck yeah! Nice! 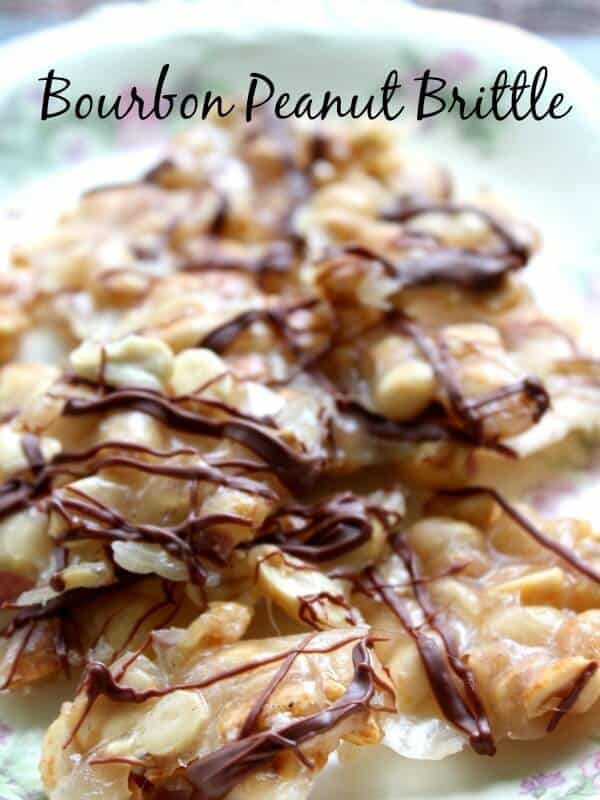 Peanut brittle’s always been a favorite indulgence of mine and this looks and sounds terrific! You had me at “measuring cup to mouth in about 20 minutes.” It is a great recipe when you need to satisfy a sweet tooth quick! Yes, I love recipes that are quick and easy! This brittle sounds delicious Marye! I love the bourbon twist! We have been getting nothing but rain here lately, so I know exactly what you mean about the humidity! Love that this candy still works though…peanut brittle is one of my faves and this looks amazing! It looks like it’s clearing this week. Sunny and low 90s… Which is great because the kids have youth camp this week! First of all, you crack me up. I have a vintage cookbook addiction too….I love that many of the millennials are rediscovering what seems vintage to them (The Silver Palate) but that I am STILL making. LOL. Anyway, I haven’t made peanut brittle in a long time, but this looks like something I would make in New England in the winter for Christmas or apres-ski! I’ll add it to my list of “must trys.” Thanks Marye! You know I’ll be making this! I love peanut brittle and the addition of bourbon and chocolate drizzle really take this up a notch! Looks fantastic! I love peanut brittle and I bet the addition of bourbon brings it over the top! Love the chocolate drizzled all over – extra yum! Pinned. Thanks! It really was good! I hear ya on making candy when it’s humid. It isn’t pretty. 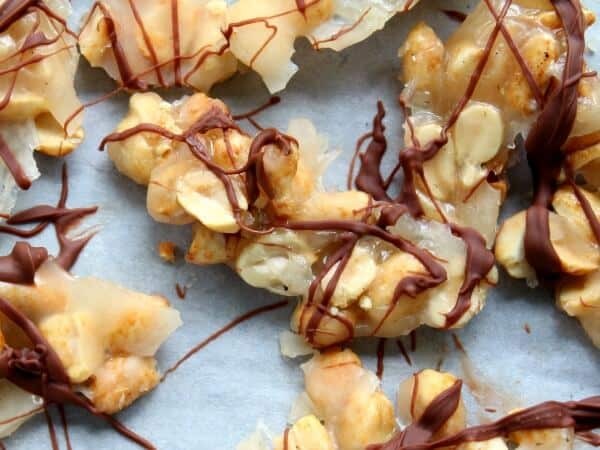 I LOVE brittles and other candies and this brittle looks phenomenal. Can’t wait to try it! I was surprised this worked so well! I love making brittles of all kinds! This one with a touch of bourbon makes me hiccup just thinking about it! Love it! Yep.. it’s pretty much gone here. LOL!